We searched the Internet for tools that would help prepare you for the personal training tests. But the products we reviewed were all disappointing. So we decided to build our own Online Exam Prep Course! If you are preparing to take a personal trainer certification exam, then you are going to want to take our online review course. Our goal was to deliver Twice the Content at Half the Price. And if you don't pass, we will give you Double your Money Back! Avoid having to pay costly retest fees by passing your exam the first time! Our Personal Trainer Certification Course helps you avoid wasting time and money (up to $185 for some certs) by helping you know when you are ready to pass the exam the first time. We cover all the areas of the major certification exams and give you lots of practice questions. With so many questions, there is a much higher chance of seeing familiar questions on your certification exam. You get our Certification Prep Course, the 230 page e-book for offline studying, along with our Double your Money Back Guarantee for only $32.95. Pay securely with your credit card or Paypal to access the immediate download. Take our five question Sample Personal Training Test. And with over 750 practice questions in our online exam prep course, chances are you are going to see dozens of familiar questions on your certification exam. You can also review the testimonials and FAQ below. 1) We don't just tell you that you got the question wrong, we tell you *WHY* you got the question wrong. 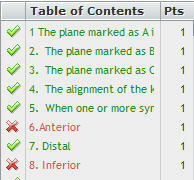 2) Each quiz has a table of contents that gives you instant feedback on your results. You can quickly navigate to review questions you got incorrect. Here's your chance to have share what you thought about our review course. Did it help you pass your exam? Would you recommend it to a friend? Was the price fair? You can also Ask a question, submit a comment, or even rant or rave about our certification review course. Read what other people are saying or asking about our certification review course. Click on each link to read the comments submitted by our readers. Is this test prep up to date? Thanks so much! How up to date is your test prep? I have the ACE 5th edition and curious if its based on this latest edition. Is this updated for the 5th edition of NASM? 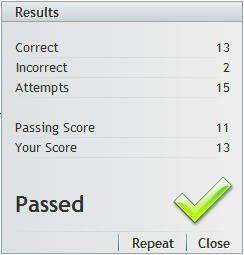 Just took ACSM exam 7/21 & I passed! how up to date is this? Will the Course Help with other Exams? 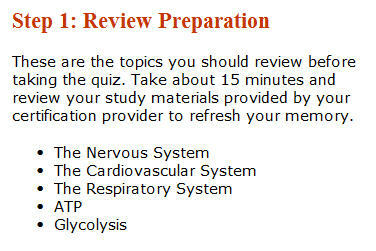 Great way to prepare...gives you many extra questions to supplement your study materials! *Terms and Conditions - We are not a certification provider and do not provide personal training certification. The exam course in an independent course and not affiliated or approved by any certification provider. You should take our review course in conjunction with another certification course. If you use our review course along with the study materials provided by your certification provider, you will have a much greater success rate on the exam. If you fail your certification exam, you can apply for a double your money back course refund by sending us a copy of your test results showing a failing score. The date of the exam must be at least 21 days after the purchase of our course to allow for adequate use of our product. Refunds are not available for affiliate sales. This is a 100% online course. No refunds will be given except for our money back guarantee described above .